I am impressed with this well crafted crime/legal thriller, a debut fiction novel for South African born Australian, Alex Hammond. Set in Melbourne, Blood Witness introduces Will Harris, a defence lawyer for a large legal firm. Tasked to instruct barrister Chris Miller in a high profile murder trial, Harris has to think outside the box to prevent their client from being branded a killer. The case demands all of Will’s attention but when Mischa, the younger sister of his fiance he lost in a tragic accident two years before, is charged with serious drug related offences, his attempts to secure her release threatens to compromise the trial and derail his career. Hammond deals with the novel’s two major story lines and additional subplots with unexpected skill for a debut novelist. The author is a lawyer so his knowledge of legal process lends authenticity to the detail but he avoids intruding on to the flow of the novel. The story is well paced, the tension well maintained and the dialogue genuine. The first major plot of Blood Witness involves Will’s defense of Martin Keir. Wealthy and arrogant, the accused likes young girls and though he admits to sleeping with the fifteen year old victim, he denies being involved in her brutal murder. Despite the damning evidence, Harris is tasked with developing a case to establish reasonable doubt, something that seems unlikely until Harris interviews Peter Kovacs who is convinced he witnessed the crime in a dream. At first Harris dismisses the statement as unusable, simply the hallucination of a dying man, but as their defence begins to crumble an almost forgotten precedent may give Kovacs his day in court but at the risk of ruining Will’s career. The second major plot thread sees Will struggling personally as he tries to help his fiance’s younger sister. Harbouring guilt over his fiance’s accidental death, he is determined to do all that he can to help Mischa but his impulsive handling of her case makes him a target of a nosy journalist and places him at odds with a dangerous criminal organisation. I particularly liked the way in which Hammond balanced the professional with the personal aspects of his protagonist. I felt I got to know Will Harris on both levels, learning what sort of man, and what sort of lawyer, he is. I found Will to be an appealing character, supported by a solid, complementary cast. I think Blood Witness is an entertaining and interesting thriller and a great start to a new Australian crime series with lots of potential. 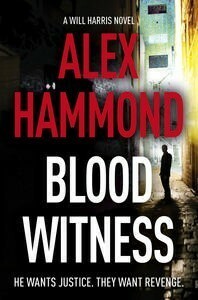 If you enjoy crime fiction I’m happy to recommend you give this debut author and Blood Witness a try. Sounds gripping, will have to check it out. How in-sync are you and Bree, or perhaps just conscientious posting so close to the release date! We seem to get a lot of the same books for review since we have similar tastes and I think we are both pretty conscientious about meeting release dates. Hi Shellyrae, Thanks for the great review and very neat summary of the set up for the plot threads. I think it’s better than my own!